The Metropolitan Football Stadium District (the District) is a body corporate and political subdivision of the State of Colorado established pursuant to the Metropolitan Football Stadium District Act, Article 15, Title 32 of the Colorado Revised Statutes, (Act). The District includes all or part of the seven counties in the Denver metropolitan area. The District was created for the purpose of planning, acquiring land and constructing a professional football stadium. The Act authorizes the District to levy and collect a sales tax on one-tenth of one percent throughout the District as of January 1, 2001 and will collect the tax for a period not to extend beyond January 1, 2012. The sales tax assists the District in financing the acquisition of land, construction of the Stadium and the payments of debt service. The Metropolitan Football Stadium District is governed by a Board of Directors of nine members who serve without compensation. The purpose of this request for proposals (RFP) is to engage the services of a qualified firm to provide Food and Beverage Services at Broncos Stadium at Mile High. The request was approved this morning by the Metropolitan Football Stadium District at its quarterly board meeting. “With the season fast approaching, we’re pleased that the MFSD has approved the temporary name of ‘Broncos Stadium at Mile High.’ While fans will notice some new signage going up around the stadium reflecting this change, we remain completely focused on securing a long-term naming rights partner. Media availability 4 – 5 p.m.
A nonprofit venture between the Metropolitan Football Stadium District (MFSD) and the Denver Broncos Football Club is exploring creating a new, mixed‐use neighborhood destination on the south end of the stadium property — now occupied by surface parking lots used only during games and special events. In response, Denver Community Planning and Development has stepped in to lead a master planning process to gather community input to help guide this potential development in accordance with the neighborhood plan — the 2013 Decatur-Federal Station Area Plan (PDF). The MFSD and Broncos’ vision is to create a neighborhood hub where people can live, work and play, as well as an enhanced gameday experience for fans. City planners want to involve the community in a master plan for this area so that the people of Denver, and particularly adjacent neighborhoods, may provide input into the future. The Denver Housing Authority (DHA), in partnership with the City and County of Denver, has a mixed-income public housing development underway in this neighborhood; planners will work closely with DHA and its residents to incorporate their needs and perspectives into this master plan. With the 2013 Decatur-Federal Station Area Plan as a foundation, a master plan will provide more detailed guidance on creating a destination in the vein of stadiums across the country looking to improve the neighbor and visitor experience, as well as improving critical transportation connections to the South Platte River, transit stations and downtown. The Metropolitan Football Stadium District owns the property slated for the plan. The MFSD and the Broncos hope through this future development to create a long-term, recurring income stream to support maintaining and improving the stadium, a taxpayer-owned asset. The MFSD and Broncos expect to replace any parking that is lost to development. Public meetings will begin in spring 2018. Learn more at denvergov.org/stadiumdistrict. BUILDING COMMUNITY: Denver Community Planning and Development (CPD) is responsible for visionary city planning and ensuring safe, responsible, sustainable building. CPD regulates planning, zoning, development and maintenance of private property in Denver. We’re working hard to make Denver a great place to live, work and play! Visit DenverGov.org/CPD or follow us on Twitter at @DenverCPD. The Metropolitan Football Stadium District is a body corporate and political subdivision of the state of Colorado established pursuant to the Metropolitan Football Stadium District Act, Article 15, Title 32 of the Colorado Revised Statutes. The district was created for the purpose of planning, acquiring land and constructing a professional football stadium. The Metropolitan Football Stadium District learned Tuesday that a fan attending Monday night’s game succumbed to injuries after falling over a stairwell railing shortly after the game. The District and the Stadium Management Company are in the process of learning more about the incident. Our thoughts are with the deceased fan’s family and friends. “The Metropolitan Football Stadium District (MFSD) was informed that a motion was filed in a Delaware Court for the Denver Broncos to assume the naming rights contract for Sports Authority Field at Mile High. “The filing of bankruptcy by Sports Authority had left uncertainty in the future of the naming rights of Sports Authority Field at Mile High. The Denver Broncos assuming the naming rights offers some clarity in the future of Sports Authority Field at Mile High. “In anticipation of a potential court decision, the District Board directed the staff to prepare a request for proposals (RFP) to seek a valuation for a new naming rights partner. Those efforts will continue as both the court and District processes move forward. “Pending court approval, the Denver Broncos will assume the MFSD contract with Sports Authority. 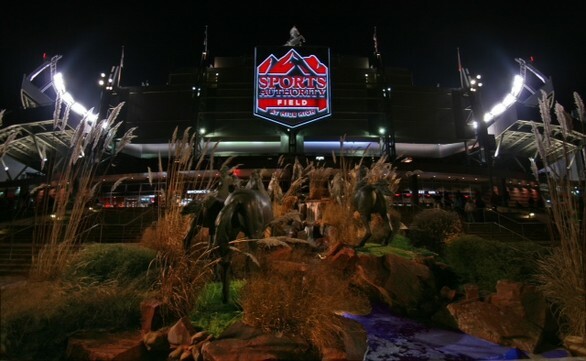 The purpose of this request for proposals (RFP) is to engage the services of a qualified firm to provide to the Metropolitan Football Stadium District (the “District”) and the Stadium Management Company (“SMC”) a review and assessment of the on-going capital needs of Sports Authority Field at Mile High over the next 30 years (a Facility Condition Assessment (“FCA”)). The City and County of Denver Department of Planning and Development is currently undertaking the process of developing a General Development Plan (GDP) for the area immediately south of Sports Authority Field at Mile High. The area includes the Sun Valley Neighborhood and the recently completed Decatur-Federal RTD Light Rail Station. For more information about the redevelopment project, please go to www.denvergov.org/decaturfederal. The Metropolitan Football Stadium District and the Denver Broncos recently agreed to fund approximately $30 million worth of improvements to Sports Authority Field at Mile High. Over the last 12 years, the Denver Broncos and their partners have spent over $28 million in stadium improvements. This latest round of improvements will include some very visible upgrades including new High Definition Video Boards and a makeover of the lower concourse. Additionally, upgraded health/safety communications systems also are improved to provide better communication in case of an emergency.